A new venue and more new letters! shows. 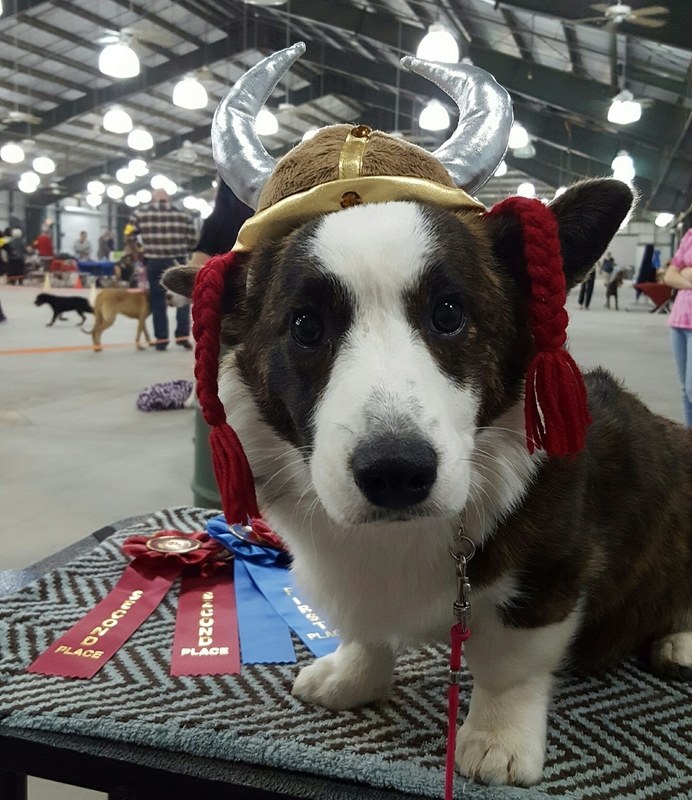 These are international style shows where each dog receives a written critique and a ratings card that earns their title. The IABCA offers what they call the baby puppy class 3-6 months which was just right for 5 month old Cali. Schwalbe (USA), Ms. Luanne K Dunham (USA) and Ms. Juliann Bitter (USA). Groups were done by a 2 judge panel, we were also judged by Mr. Steven M Jeffery (USA) and Ms. Gloria Kerr (USA). 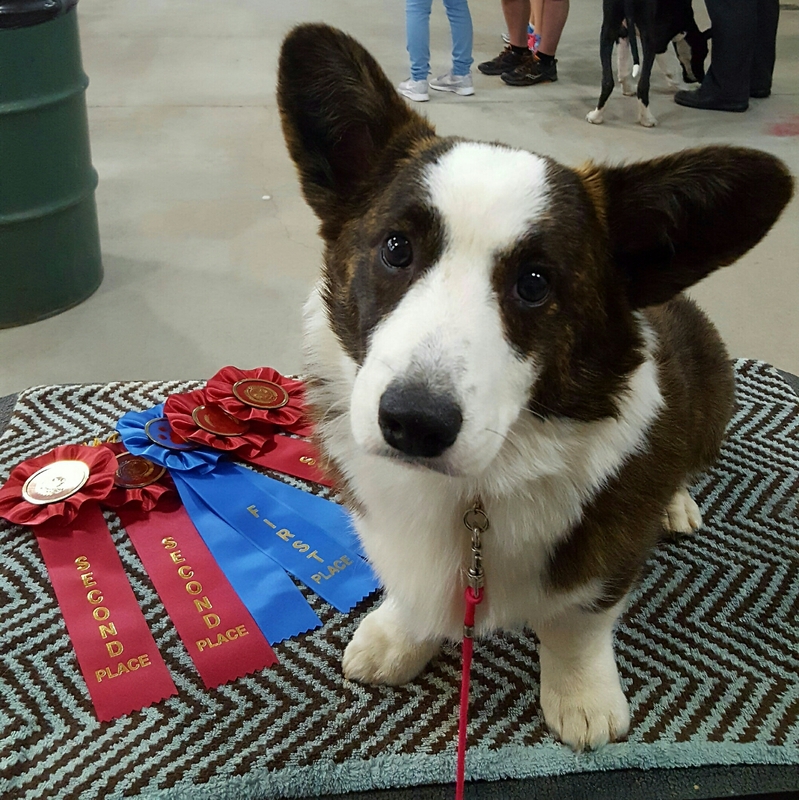 Cali received 5 SG-1 ratings which is the highest rating a puppy can receive and in doing so earned her IABCA National Baby Championship (NatBA), International Baby Championship (IntBA) and her Honors Championship (HnrBA). & Rear Quarters “Good shoulder layback and Good rear angulation”. “Excellent”. “Well angled, muscular” Ears – “Correct shape, well used”. “Well set and carried, excellent size. In addition to earning her puppy titles she also did well in the groups, she was awarded one Puppy Group 1s and 4 Puppy Group 2s. folks so they wouldn’t miss their ring time. club friends and watch other breeds. Cali and the Pem girls Edith and Eleanor got lots of training time too (along with some nice wins for all the girls). titling options. I remember I had to pay fees for our Mexican title certificates too and they were big fancy certificates so I will probably do it. is growing up. There is another IABCA show schedule for later in the year and if the schedule allows I will go again. Cali says we conquered this show thing! I’m proud of the baby girl, but I can tell you she was TIRED! At the end of the day. She debuts in AKC next week in the 4-6 puppy class, we will see if she remembers what she learned this weekend.